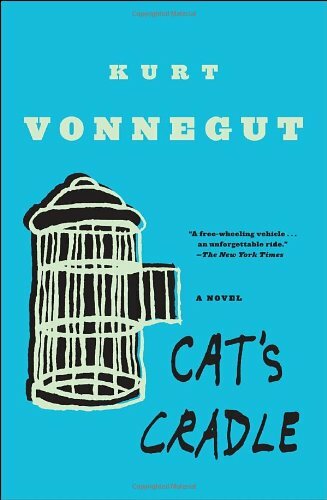 I've read Vonnegut before, and if asked I always say I like his work, but Cat's Cradle was tough to get through. It's just so dark. There's always that trademark Vonnegut wit to lighten the mood—one of my favorite examples is the vapid secretary Miss Pefko, described as “ransacking her mind for something to say, finding nothing in it but used Kleenex and costume jewelry.” Still, this one is pretty bleak (as one would expect, I suppose, in a novel about reckless scientists causing the end of the world). Vonnegut's main concern is to illustrate the problems that come up when scientists pursue “pure knowledge” with no regard for how their work might be applied in the real world. Dr. Felix Hoenikker is the inventor of ice-nine, a sort of super-ice with a melting point of 114 degrees. After his death, his three children get their hands on the product and sell it off to various bidders. What Hoenikker apparently didn't bother to consider is that even the smallest amount of ice-nine is so powerfully cold that if it comes in contact with water (like a lake, say, or an ocean), it will immediately flash-freeze all of that water. Thus ice-nine has the power to almost instantly freeze, and thereby destroy, the whole world. So yeah, we're dealing with some heavy themes here. Vonnegut brings up interesting questions about the responsibilities of scientists, and he does so within his own absurd little world that only starts to look like ours when we pay close attention. Through his bizarre fictional religion, Bokononism, he also introduces questions about whether religion can be useful even if it is built on lies. The followers of Bokonon know that their entire worldview is based on foma—harmless untruths—but their lives are made better by them. As usual, I found Vonnegut's treatment of his female characters to be bizarre and off-putting. Women in the book fall into one of three categories: excruciatingly idiotic, as in the case of Hazel Crosby, who is forever talking about “Hoosiers,” unattractive and therefore unimportant, as in the case of Angela Hoenikker, whose only way to land a husband was to sell her share of ice-nine, or physically beautiful and therefore perceived as wise, as in the case of Mona Aamons Monzano, who is essentially traded between men and “given” to the narrator to marry as if she were a prize heifer. But, you know, she's beautiful and mysterious, so it doesn't have to make sense that she's totally fine with being treated like a slave. Cat's Cradle is certainly the most challenging read on our list so far. It stretched my interpretive abilities and my attention span. It also revealed that I may be something of a hypocrite when it comes to sci-fi. With Starship Troopers, I complained that Heinlein was too didactic and should have worked his philosophical ideas more organically into the narrative. After reading Cat's Cradle, I complained to Adam that Vonnegut was too veiled and obscure and should have stated his premise outright. Is it a case of porridge too hot, porridge too cold, or am I just biased against sci-fi and looking for any excuse to complain? Maybe I need to continue the Challenge to find out. As always, I welcome your comments here or on Facebook or Goodreads. What did you think of Cat's Cradle? Summer of Sci-Fi continues next Sunday with Dune by Frank Herbert. See you then!